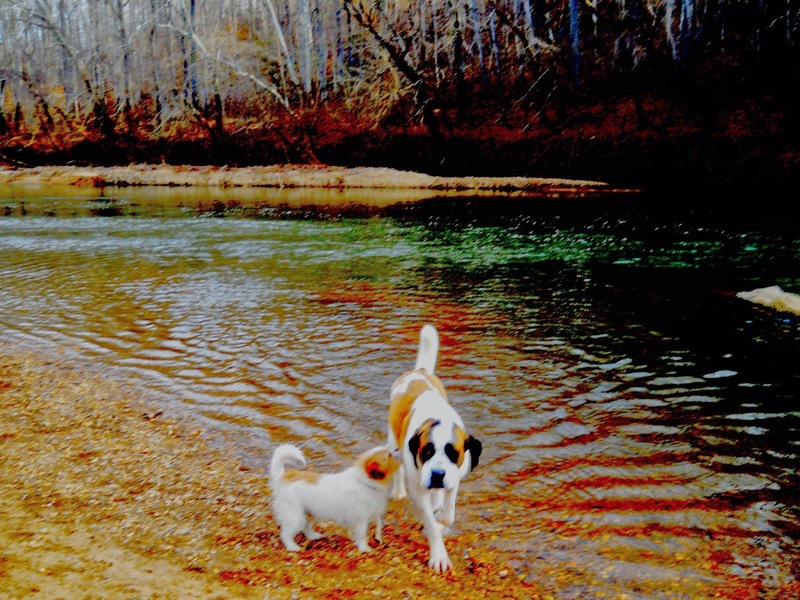 MORNING ACTIVITY-- SUNDAY AT THE BEACH WITH DOGS: Riley, our part- Shitzu/part-Jack Russell terrier thinks Dezi, a Saint Bernard, is the perfect playmate. Dezi’s not so sure. Our visit to the river was followed by a bath to get rid of the dog-poo perfume Riley picked up on the way home. LISTENING TO: S.C. Gwynne’s Rebel Yell, a biography of Stonewall Jackson. I suspect this book will be part of my life for quite some time as the listening is a shared project with my husband, Gordon. We only knock off about 30 minutes at a time. Gordon has lately taken an interest in Stonewall, a man whose quirky character and military acumen made him both legendary and fascinating. In these parts, he’s so legendary that when I recently went to the library to return a book, I found it closed in celebration of Lee Jackson Day. 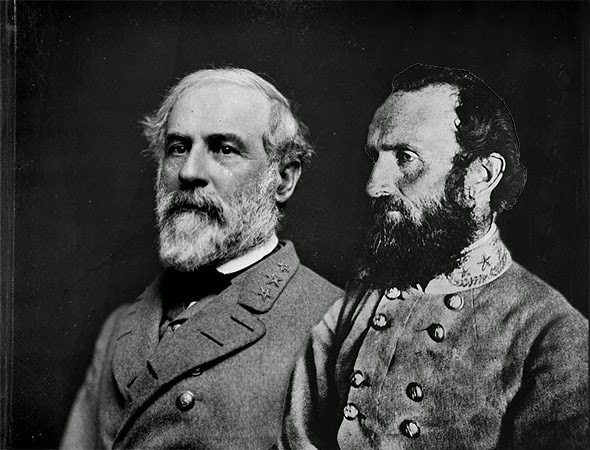 Virginia celebrates these two Confederate heroes close to Lee’s birthday on the Friday before Martin Luther King Day. It’s not a big deal—schools and banks are open, but some state, country and city offices are closed. Deal or not, in nearby Charlottesville those closures and that day of celebration are currently the subject of passionate debate at City Council meetings. You might imagine what the two sides have to say. Coincidentally Rebel Yell begins with a scene in Charlottesville, hooking me in with newfound familiarity. Some takes plays in not-too-faraway Lexington where Jackson was a professor at Virginia Military Academy. And then so much plays out in nearby battlefields. I’m gaining insight into Jackson, the soldier and religious zealot, so calm in battle that many marveled at his serenity. He believed he was doing God’s work and only God could determine the moment of his death, so faith overcame fear. I’m gaining insight too, into Virginia and for a child or New England, one of those insights is that average non-slave holding Virginian soldier fought not over state’s rights or slavery but because their home state was invaded. As one captured Southerner put it to his Northern capturer: “I’m fighting because you’re here.” Makes new sense to me. But sometimes the books you read have music in them as in The Bone Clocks. :) I think I saw that biography of Stonewall Jackson at our library. It did look intriguing. That's true. And I notice the music. That was particularly true of Richard Powers recent book Orfeo. Orfeo is a book filled with music of the 20th century -- an amazing book -- but Powers is a little like David Mitchell -- so brilliant that you keep noticing how dazzled you are rather than following the story. Your reading experience of David Mitchell sounds a bit like mine with Neal Stephenson. It's all mesmerizing, but I'm not completely sure I understand. And, I'm not sure I even like it -- it's almost more like an addiction. But I read two books last year and will probably read at least one more this year. Yup. Just not sure what I think, how I feel because the experience keeps changing. So many names. So many personal histories. Need to read and take notes too which I've done before -- but not this time. I can't wait to get back to David Mitchell, but I've got so many other things lined up!! 'The Bone Clocks' was my first Mitchell and I was bowled over by it. I would love to find the space to read his other novels but am worried that his earlier work may be somehow lesser and that I would be disappointed.